Prepare to die a million times. The whole “Twitch Plays…” phenomenon—in which people try to prove the “give a thousand monkeys a thousand typewriters and a thousand years” thing, except with video games—has reached its logical conclusion. 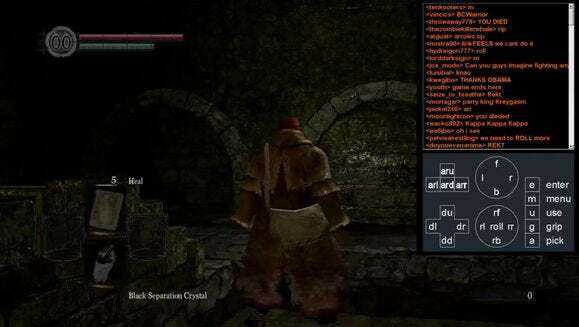 After beating Pokemon and even somehow beating Halo, Twitch is now communally playing Dark Souls, a.k.a. the game that is already nigh-on-impossible for some people to complete playing normally. It is not going well. At the time I’m writing this (about 12:15AM Pacific Friday morning, because I am bad at sleep) they have somehow made it past the Asylum demon and activated the second bonfire. But they are playing the Cleric class (oops) and have managed to unequip both their weapon and shield. Also, they keep getting tangled in the menus, and more than once have moved ten feet only to use the Darksign to reset their progress back to the bonfire. And they haven’t even reached one of the many parts of the game where the player can step off a ledge and die. I’m going to be honest—I don’t think Twitch can do it. I will potentially eat those words in a few months if Twitch somehow accomplishes the impossible, but in the twenty or so minutes I’ve been watching Twitch hasn’t so much “played” Dark Souls as it’s merely left the game running. I haven’t even seen them kill a single enemy, though people in chat swear it happened at one point. Hours ago. If you want to watch/participate, just head over here and start typing commands into the chat feed at random. I hear “M” for menu is a great one to use all the time. Super useful.